HoRNet Plugins has released the new v1.1.3 update to TrackUtility, adding AAX support on Windows systems. HoRNet Plugins has just released v1.1.2 update to TrackUtility. BSharry collaborated with HoRNet to design a VST utility for Windows that can detect de key in your MP3 files. Sound Magic has released Headphone Mix, a special effect unit for those who mix their music on a headphone monitor system. 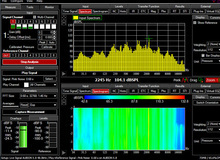 Minnetonka Audio Software announced the release of a new product for Dolby E equipped facilities, certified to run on Windows XP, VISTA and Windows 7: LTRT WavFileAnalyzer. Auralex Acoustics is now offering a retail kit that complements the company's Room Analysis Plus program for off-site analysis. Auralex Acoustics will offer its Room Analysis Plus service in a retail package, starting at the 2009 Winter NAMM show. Sonoris Meter is designed to let you accurately measure peak and loudness levels of audio signals, at one scale.